In his book The Marshmallow Test, Walter Mischel describes how the capability of children and adults to exercise self-control has a big impact on their lives. Individuals who are capable of delaying gratification and resist temptations are better capable of focusing on achieving long-term goals. They fare better in many ways than individuals who are less able to exercise self-control. Two brain systems play an important role in succumbing to or retsisting temptations. Firstly, there is the limbic system which is located in the middle of the brain, on top of the brain stem and below the cortex. This system is sometimes referred to as the hot system. This system regulates basic drives and emotions and plays an important role in the survival of the individual. 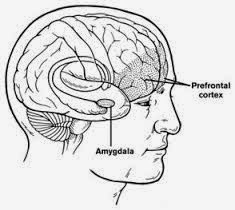 Within the limbic system there is a structure which is called the amygdala, which is a small, almond-shaped structure which can set the body into action in situations of danger or attraction. The limbic system processes information fast and rather uncritical. It is not reflective. Secondly, there is a brain system which is reflective and much more critical and careful in the processing of information This system is the prefrontal cortex (PFC). Mischel calls this the cool system. This system plays an essential role in forming sensible judgments and decisions, in making long-term planning, and in regulating emotions and resisting temptations and urges.This cool system, the PFC, is much younger in evolutionary terms and is in no other animal so well developed as in humans. It is thus one the things which eminently distinguishes us from other animals and which makes us human. The hot and the cool system interact which one another, all the time. When one of them becomes more active, the other becomes less active. This can lead to problems. In many situations, there is no immediate danger (as would be the case when a lion attacked us) but we still experiences stress and strong emotions, such as fear and anger. Our hot system urges us to come into action, fast and intensively. Unfortunately, these situations are precisely the types of situations, which require the sensible and nuanced approach which only the cool system, the PFC, delivers. You might say that in the situations in which we need the PFC the most, it is hardest to use it. How well we are able to use our PFC is not fixed at birth. A general pattern is that as children grow up their PFC-capability develops and this development generally continues until the end of adolescence. This development does not take place autonomously. Certain factors in the environment can enhance this process. How parents and teachers interact with children has a great influence on the process. When parents teach children to regulate their emotions and delay gratification this will stimulate the development of the PFC. Other factors can thwart PFC development. When individuals are exposed to long term stress this is likely to harm the function of the PFC. Another important issue is: individuals with a strong developed PFC are relatively capable of controlling themselves and to delay gratification. But this does not mean that they are necessarily wrestling with and fighting against emotions and urges. Instead, they apply cognitive techniques which, according to Mischel, take the wrestling out of self-control. An example is that they may focus their attention on something else than on the stimulus which tempt them. They may distract themselves by playing mental games, by giving themselves mental tasks, by thinking differently about the tempting object, by focusing on a goal they have given themselves, or by asking certain questions. For instance, an individual with a strongly developed PFC might when tempted not ask himself: "What would I like to do now? ", but something like: "What would a wise person do now?" The good news is that, no matter how old you are, you can train your PFC. This begins with the recognition that, in many situations, it is much better to not be controlled by your fears, angers, or temptations, but by what you think is wise and by what works. Expressing anger in a conversation, for example, is more likely to need to a negative outcome than to a positive outcome. If you acknowledge this, it becomes a bit easier to responds effectively in situations which trigger such emotions. I will mention a few examples. One way to do this is to prepare better for conversations. This makes it easier to remain focused on your goals. Another way is to use techniques such as if-then planning, searching the plus behind the minus, and progress-focused summarizing. These techniques make it more likely to be effective and they require so much mental energy that you simply may not have the mental capacity to respond emotionally.